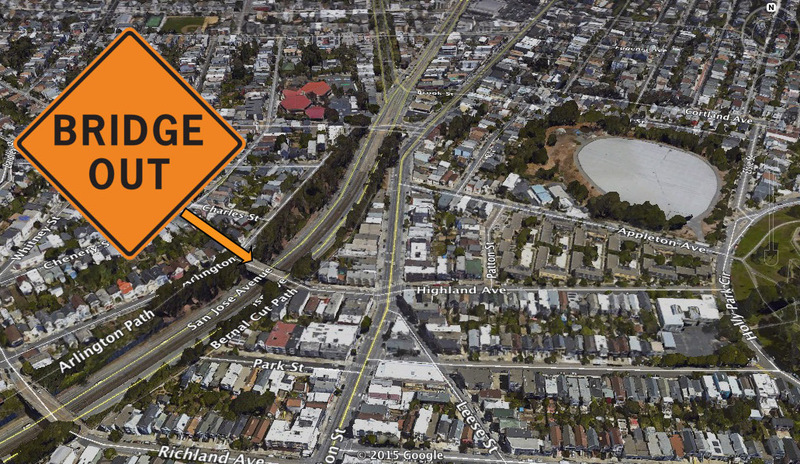 MH Construction Management Co. is under contract with San Francisco Public Works for the TRAFFIC RAILING REPLACEMENT PROJECT AT THE HIGHLAND AVENUE BRIDGE. San Francisco Public Works will manage the construction. • Construction is scheduled to begin approximately April 20 2015 and be completed by October 2015. • Highland Ave Bridge will be closed April 27 2015 for maximum duration of 6 months. • Monday through Friday: 7:30 A.M. to 4:30 P.M.
• Exception: While the scaffolding is being erected over the bridge, construction can occur from 1:00 A.M. to 4:00 A.M. for a few days only. The Highland Avenue Bridge at Arlington Street (off Mission Street). • Install fencing along Arlington Street. • Place 72-Hour No Parking Notices along Arlington Street between Charles St. and Highland Ave.
• Demolish existing guard rail at Arlington Street. • Prepare Highland Avenue Bridge Closure. • Erect Scaffolding (some night work). • Demolish existing guard rail (both sides). • Form & place new concrete guard railing. • The Highland Avenue Bridge will be closed to all traffic for the entire 6 months of construction. Traffic will be temporarily detoured via Richland Avenue Bridge as result of bridge closure that is necessary to perform the work. • Streets will be posted 72 hours advance with NO PARKING / TOW AWAY SIGNS, with the project work-listed, to alert the public of the construction and parking restrictions. • Please observe parking and traffic signage and allow extra travel time in case of traffic delays during construction work. This is likely terrible news for those living near the Richland Bridge, which is already treated like a racetrack . Please allow yourself more time during the construction, and SLOW DOWN through the neighborhood. I hope the Richland bridge is next on the repair list. The crumbling guardrails scare the crap out of me.